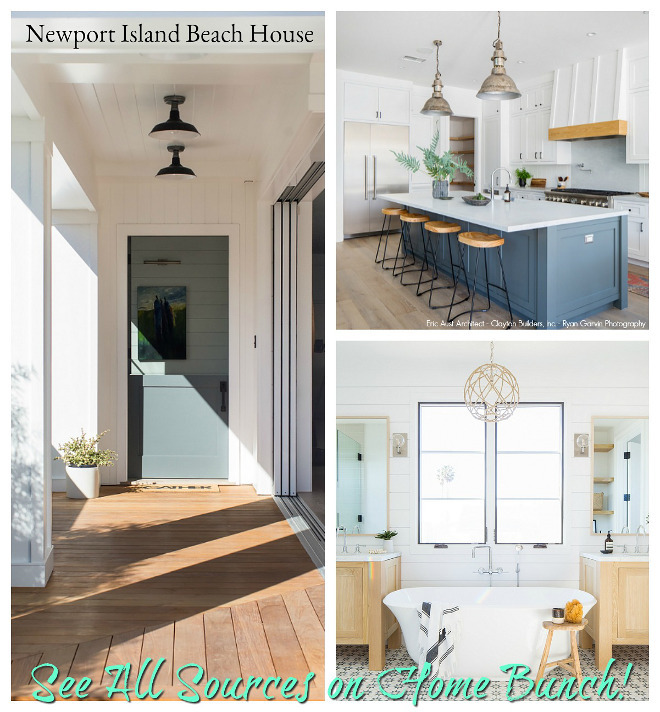 Do you like a home with character and personality? 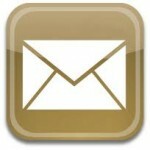 If so, you will love this new Beautiful Homes of Instagram! 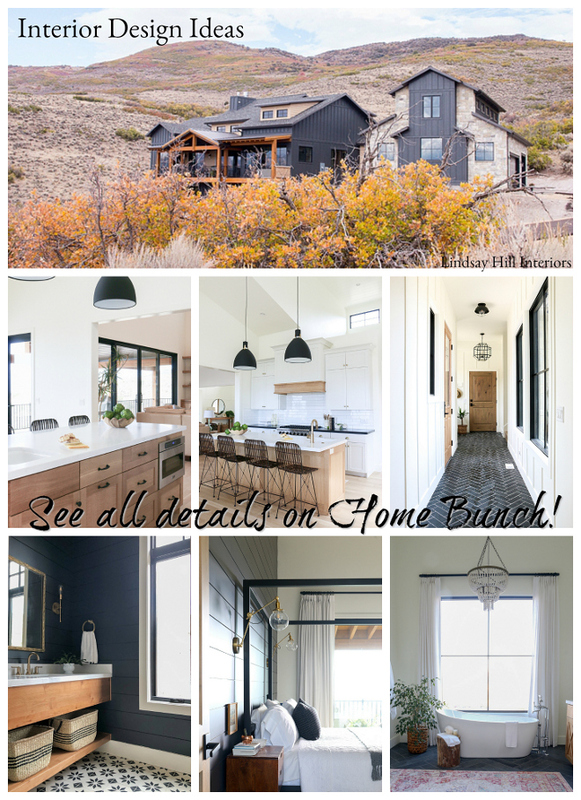 I am truly honored to be featuring Abbie of @anaberdesign. 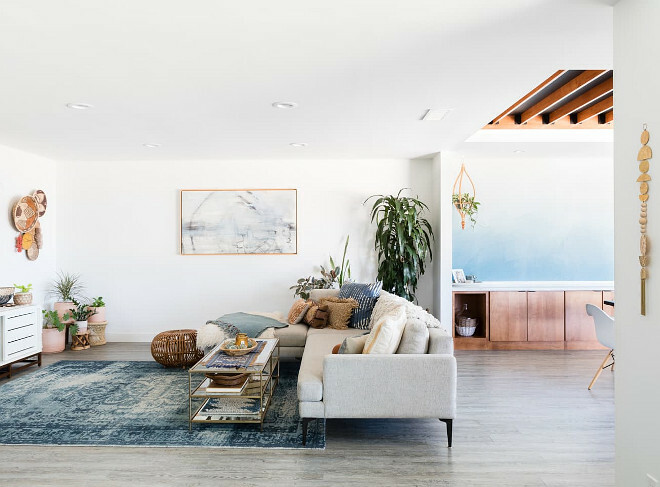 Abbie is a San Diego-based interior designer and her home was recently featured in Domino and Apartment Therapy just to name a few. Yes, this interior designer is everywhere and it’s a name you will hear and see stamped on magazines in the future. I have no question about that. 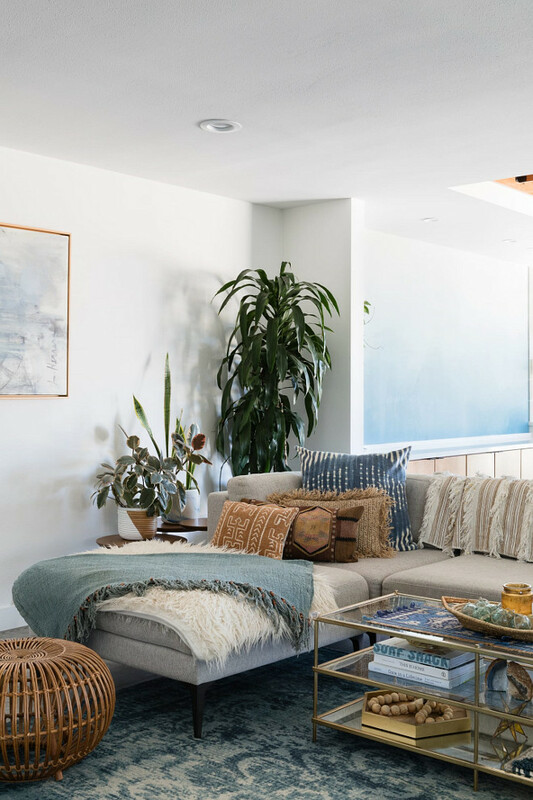 Abbie’s California mid-century modern home feels artsy, comfortable and it has a story to tell… and she is sharing all of the details below. “My husband, Malik and I bought in Spring of -2015 and closed on our wedding day! We were ecstatic about being able to afford a home in the area and knew that we’d have some work ahead in terms of updating the 1960’s original that we purchased. That was fine by us, as we both looked forward to renovating and making it a home that fit our style and taste. I would say we were heavily influenced by mid century and a modern aesthetic from the start. 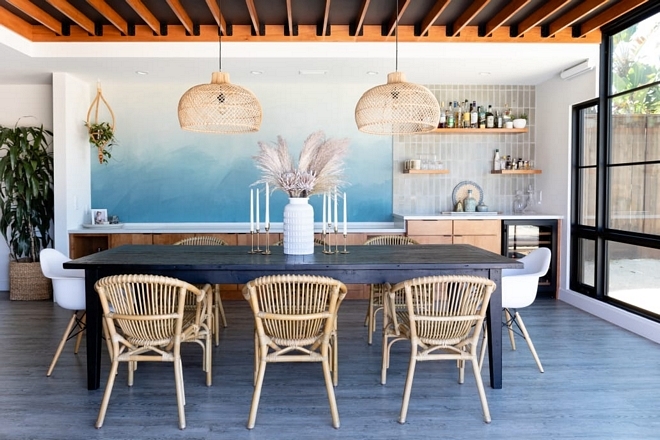 We wanted our space to reflect Southern California lifestyle but without being too beachy. Tile and wallpaper of various patterns were used to add interest and our personal touch. Walls were kept crisp and white, which I’m a fan of. That to me, lends itself to versatility and the ability to switch things up in the future as well as allow for a clean palette. 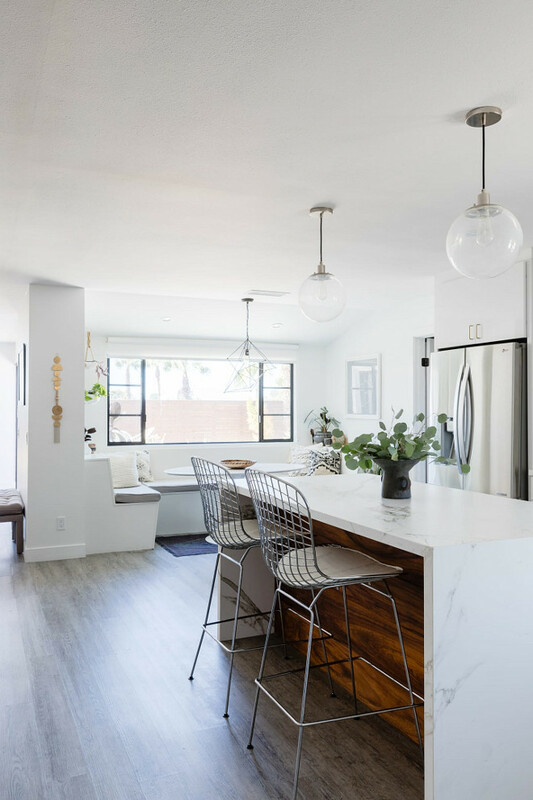 In Spring of 2016, we added square footage to our home which included a breakfast nook and dining room. Previously, our outdoor space had been our dining area when we hosted for holidays. With the addition, we were able to entertain indoors yet still maintain and outdoor feel with our pocket door system. This addition came right in time for our daughter crawling. We used this dining space as a multipurpose space now. It’s perfect for her running around and chasing the dog. 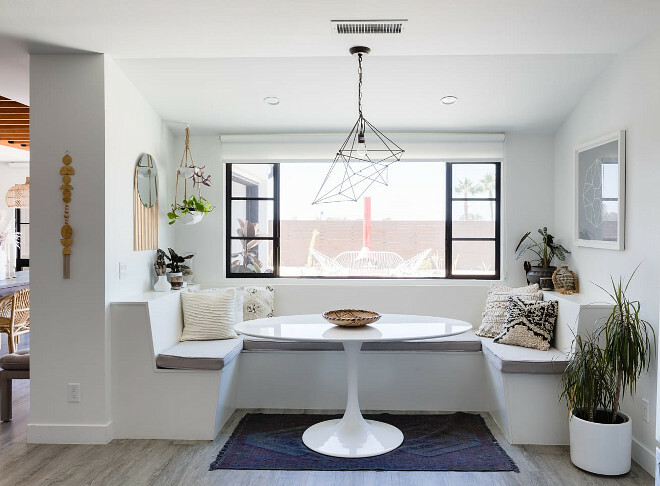 It’s amazing to see what 4 feet of space can do in the instance of the breakfast nook. By extending out 4 feet, we not only gained seating and a secondary eating area, but we also gained storage underneath the seating. 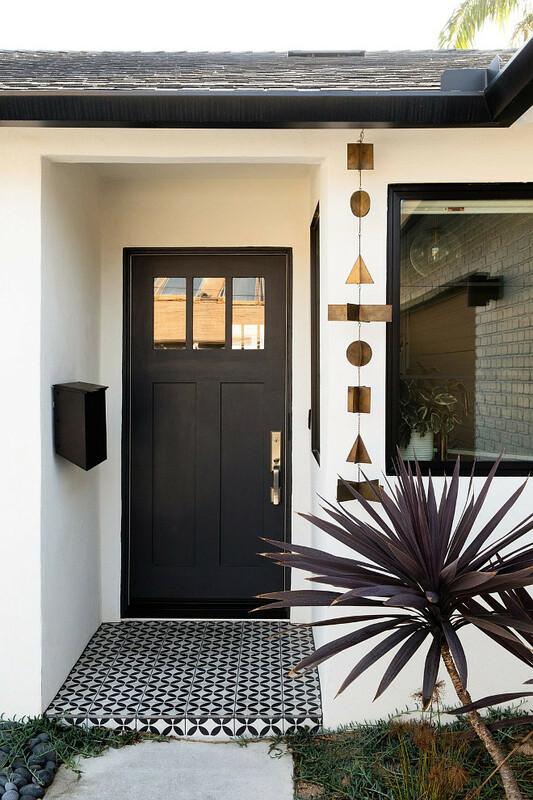 A new front door and a black and white cement tile, immediately updated the exterior of Abbie’s home. Black Door Paint Color: Black Tie by Dunn Edwards. 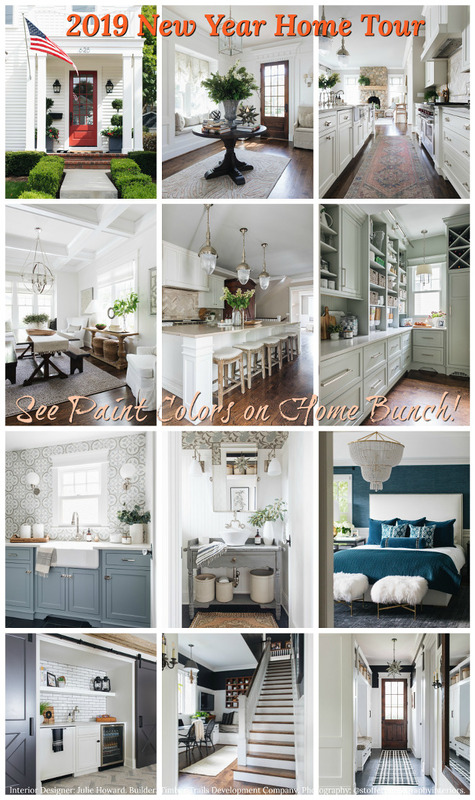 Exterior Paint Color: White Picket Fence by Dunn Edwards. Tile: Cle Tile – similar here. 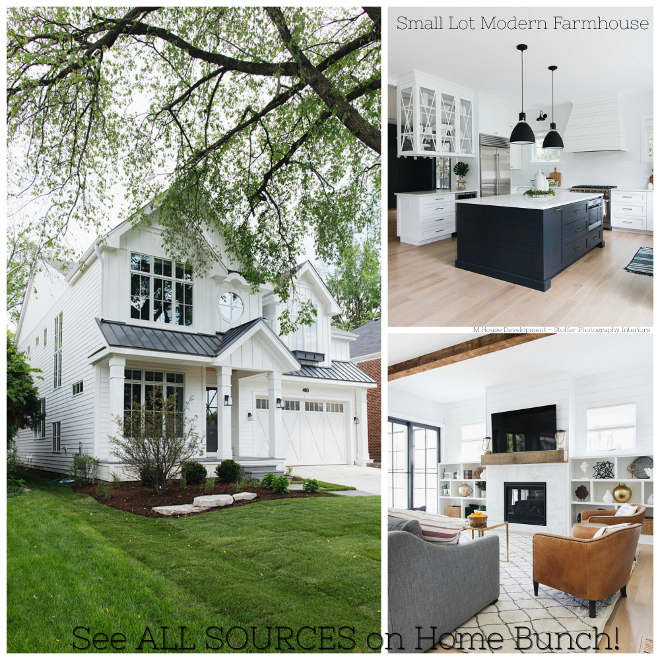 Home Size: 1,800 square feet. Our kitchen cabinetry is a white gloss thermofoil. We love the sleek and modern aesthetic for this space. 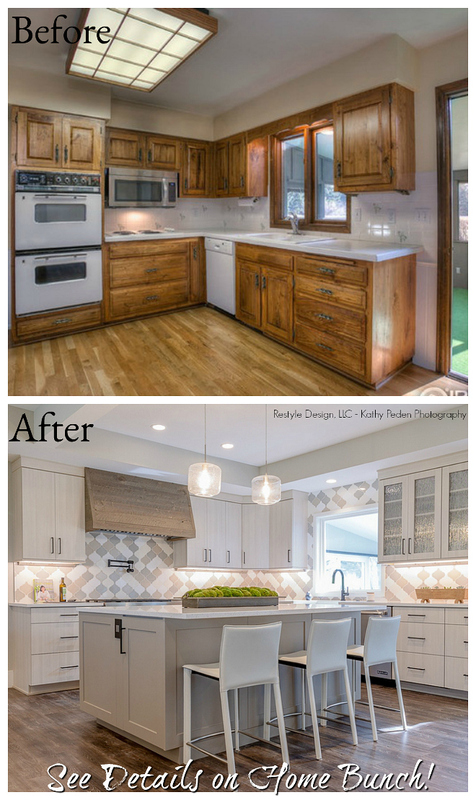 Because the cabinets are super modern, we wanted to add some texture with the backsplash. We went with a textured porcelain by Constentino. I think it adds warmth without adding a patterned tile that we could easily bore of in here. We wanted the space to be relatively neutral as it is part of an open floor plan and is situated in the same space as the living room. Backsplash Tile: Porcelanosa; Diamond White – Other Beautiful Tiles: here & here. Appliances: Cooktop: Ancona. Oven: Ancona. Hood: Ancona. Fridge: LG. We used a material called Dekton for the countertops. It’s super durable and has the look of a marble but definitely not the feel or etching potential. We absolutely love it as a marble or quartz alternative. The island itself is also made from the Dekton “Aura”. We stained walnut for the wood paneling. I think it gives it a warm contrast of color and texture. 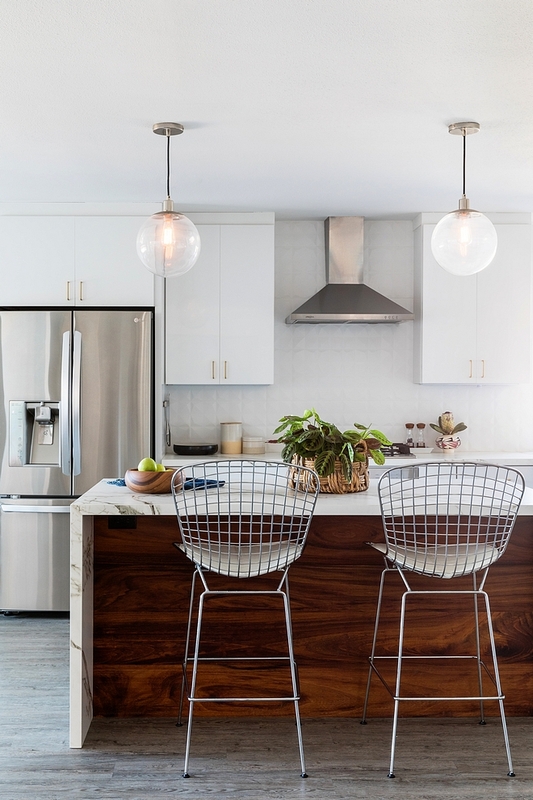 As for lighting, we used West Elm pendants with both polished nickel and champagne bronze as finishes. 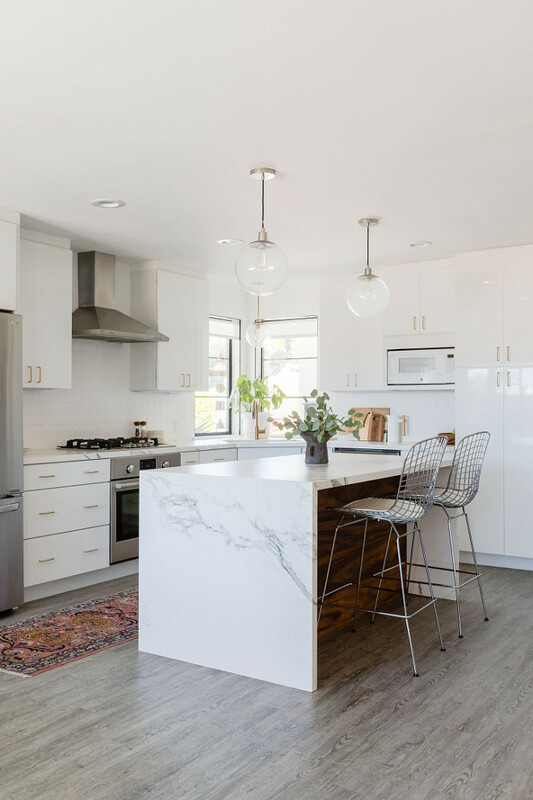 Countertops: Dekton by Constentino; Aura. Runner: Thrift store- Other Beautiful Runners: here, here, here, here, here, here, here, here & here. Flooring: CORETEC 1 – similar here. The cabinet hardware is a satin brass by Richelieu. Kitchen Cabinets: High Gloss, Kraftmaid. Similar Vase: here & here. Faux Silver Dollar Eucalyptus: here & here. 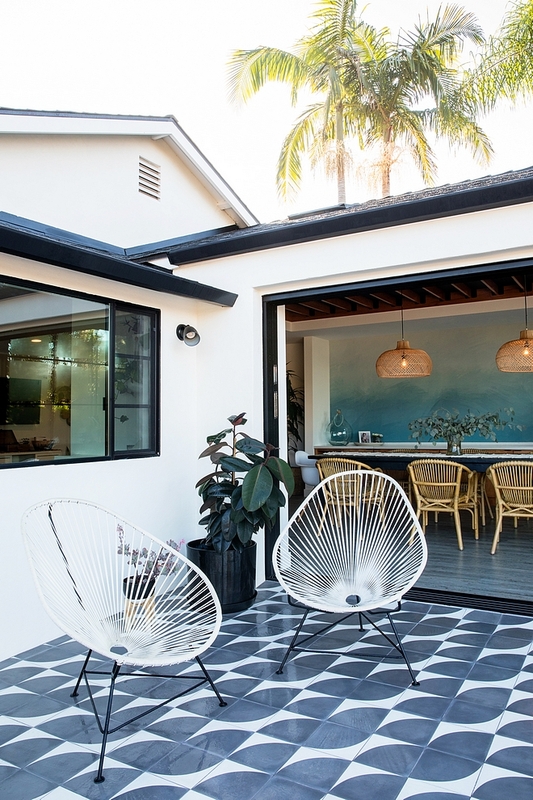 This space was part of our addition and adds so much in terms of functionality! We love sitting here and eating casual dinners. I also do a lot of my work in this space. I love the built in ledges on either side of the nook. 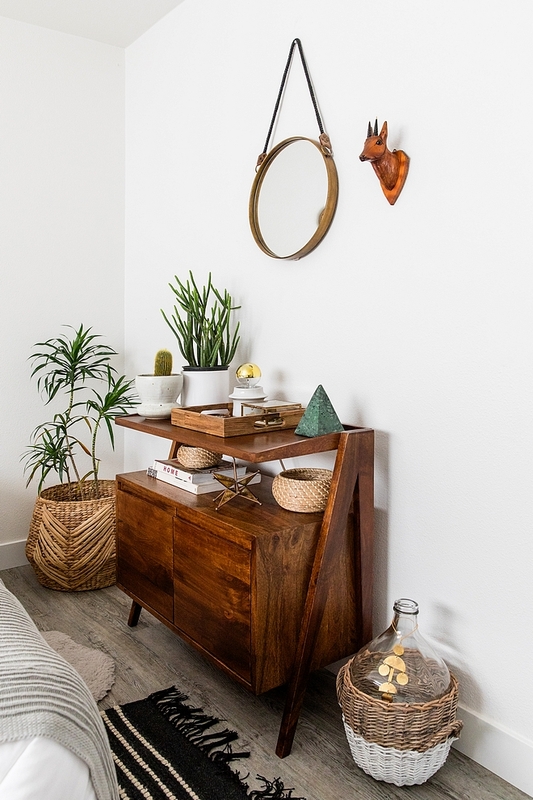 They house a lot of greenery as well as fun vintage and global finds from the past few years. Table: Modway – similar here. White Ceramic Floor Planter: West Elm. Pillows: Various- CB2, A Naber Design, The Garage Collective, Urban Outfitters. Brass Wall Hanging: Vida and Luz. This space is the newest addition to our home. It was the best decision we could have made for additional square footage. 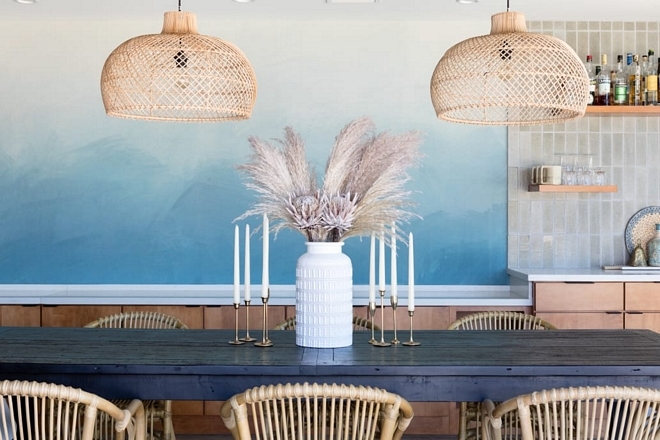 Often times, “dining rooms” take on a stigma- think formal dining spaces of the 1980s’…. but this is certainly not the case with ours. 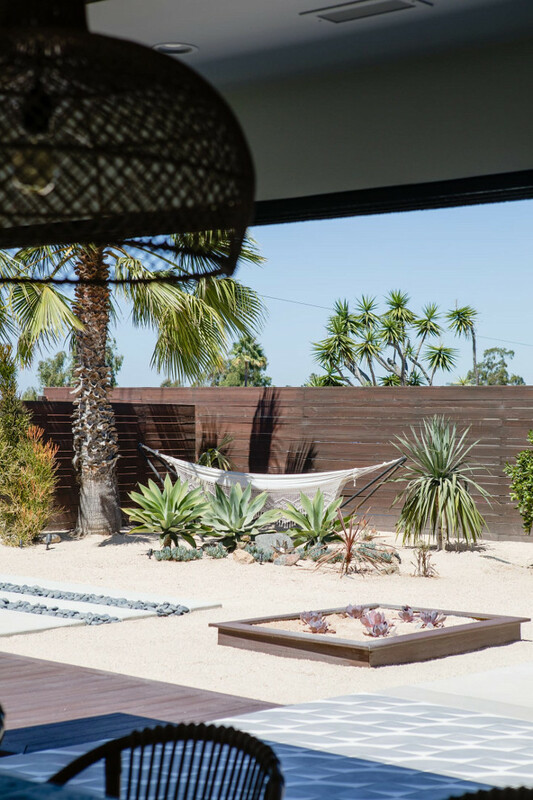 We wanted the space to feel like a true indoor/outdoor room and not lose our view to the outside. It was our contractor’s idea to vault the ceiling so that the addition didn’t look like an addition but instead, part of the original home. We added wood planks and black metal brackets to modernize the ceiling. The windows are huge and truly bring the outdoors in. Macrame Table Runner (similar): here & here. One of the first ideas I had for this space was the wallpaper mural for the wall. 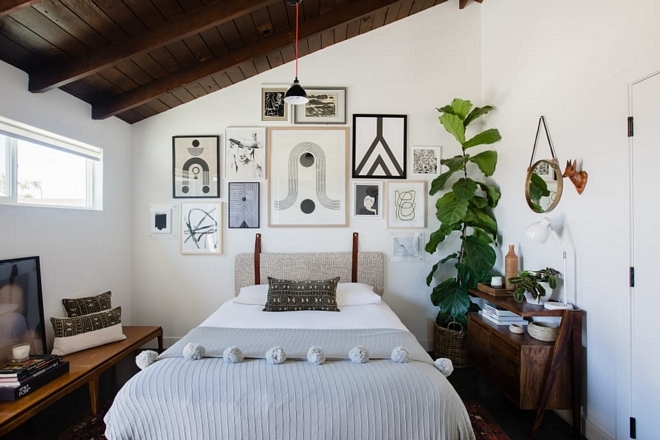 Decorating a wall of this size can be pricey with multiple pieces of art. Instead, we opted for a watercolor like mural which again ties in the outdoors. Wallpaper Mural: Anewall Décor – other beautiful wallpapers: here. 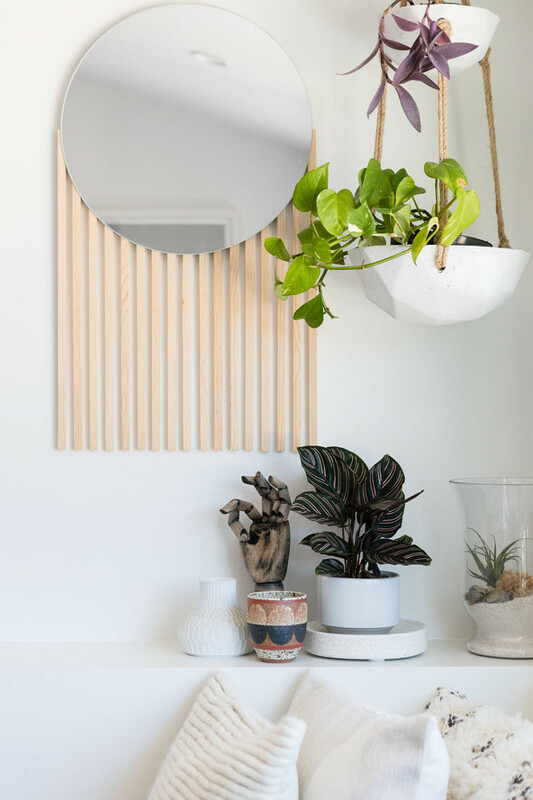 Hanging Planter: Jungalow – similar here. 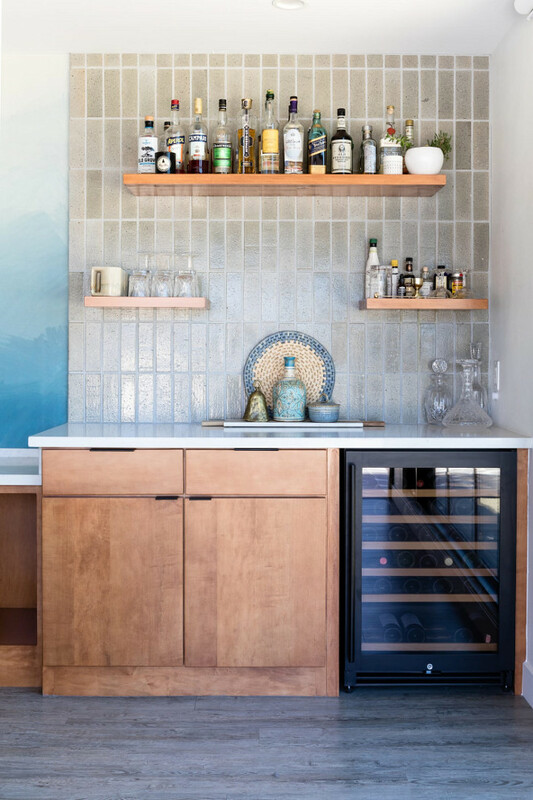 A must have item for this space was the bar. Ideally, my husband wanted a walk behind bar, but that wouldn’t work with our layout. We also added a ton of storage with our built in cabinetry. Custom Built in Cabinetry: Kraftmaid. Bar tile: Cle Tile – Other Similar Tiles: here, here, here, here & here (terracotta tile in white). 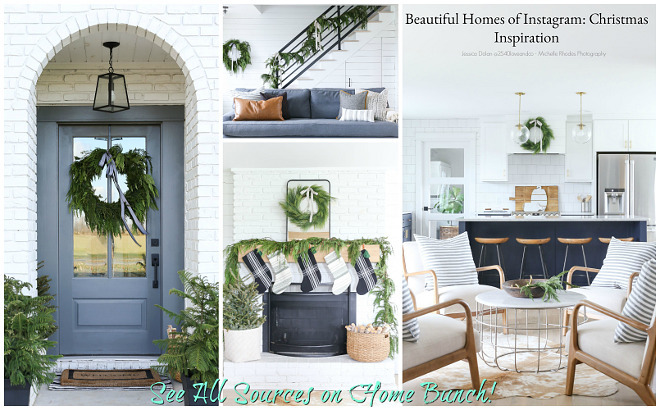 Lighting: Petite Lily Interiors – similar here, here, here & here. 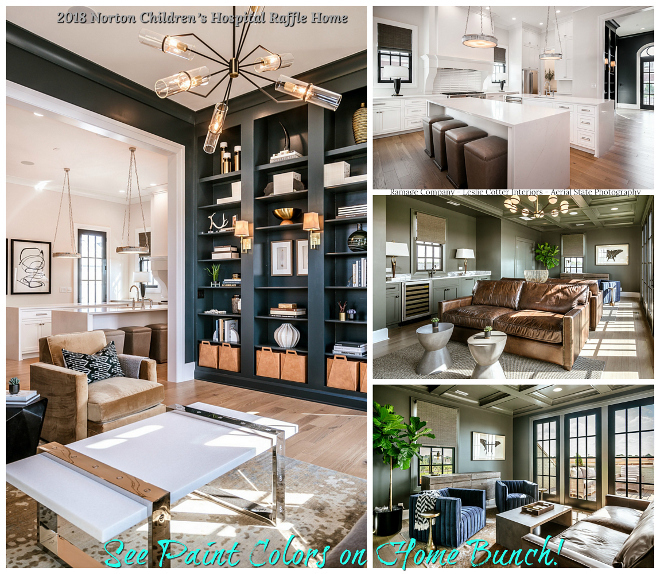 Table: Restoration Hardware – Similar here – Others: here, here, here & here. 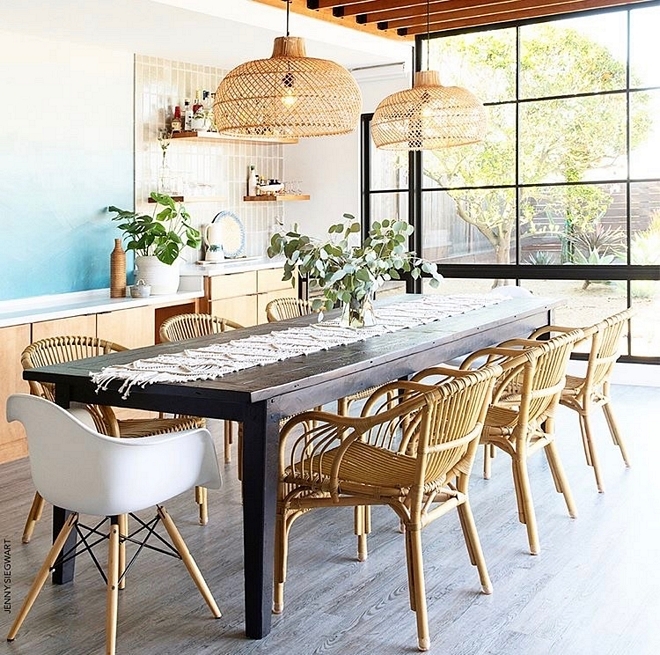 Host Chairs: here – similar. This room probably gets the most “wear and tear” in our home and is situated directly across from our kitchen. Prior to our addition, we had a 1960’s original wood paneled wall that acted as a cool accent wall. We sadly had to part once the addition was underway. 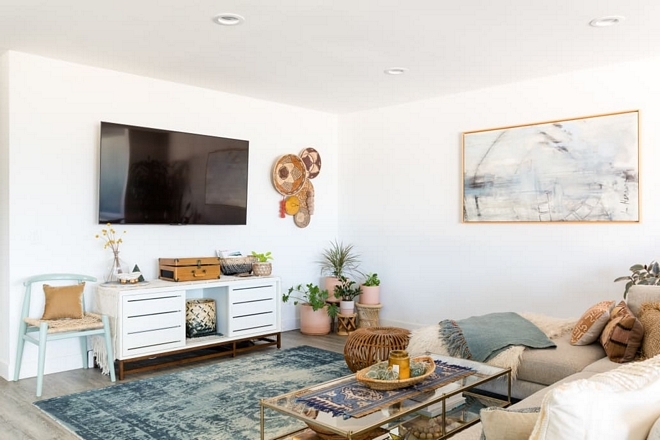 This space in our home is cozy, functional, yet also maintains a design forward aesthetic. I love to find unique items at the flea market and incorporate them into our spaces. You can find a lot of these pieces in our living area. I love layering textiles and patterns with the use of pillows and blankets as you can see here in the spaces. Throws: Anthropologie & local store. 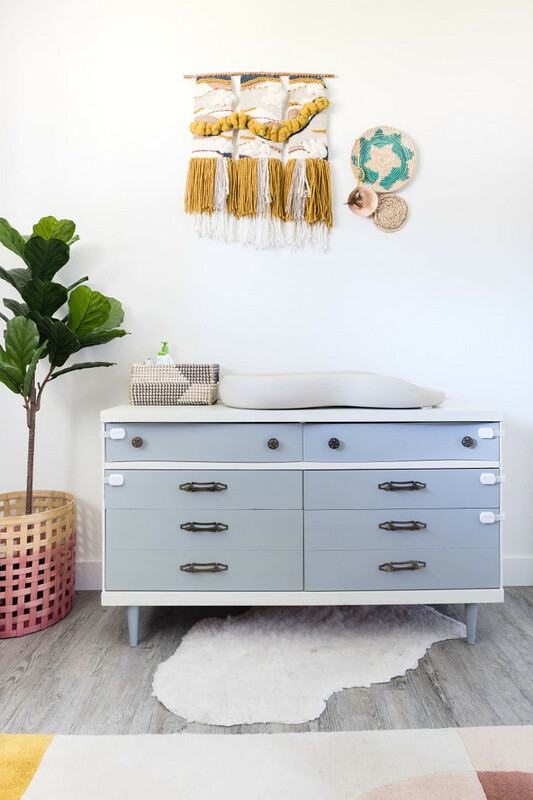 Rattan Ottoman: here & here – similar. This area is where our daughter spends a lot of time playing, so it also serves as a playroom of sorts. 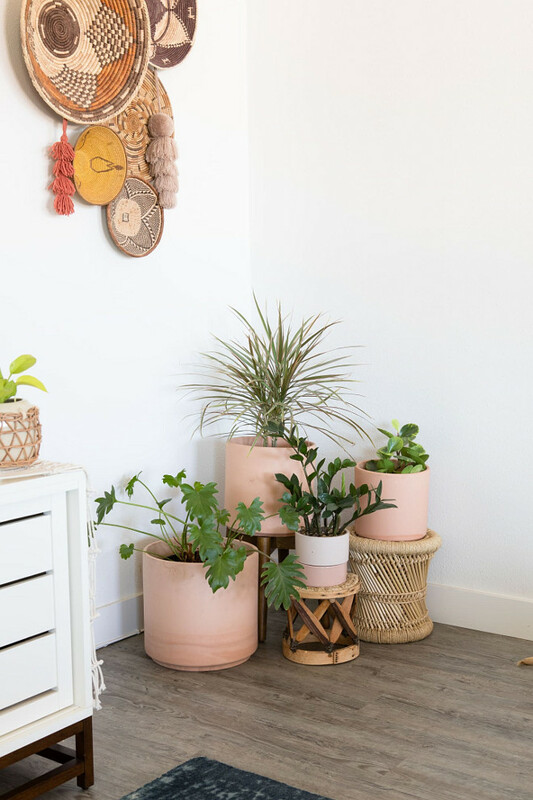 These earthenware planters are from Bohemian General and Urban Outfitters – similar here. 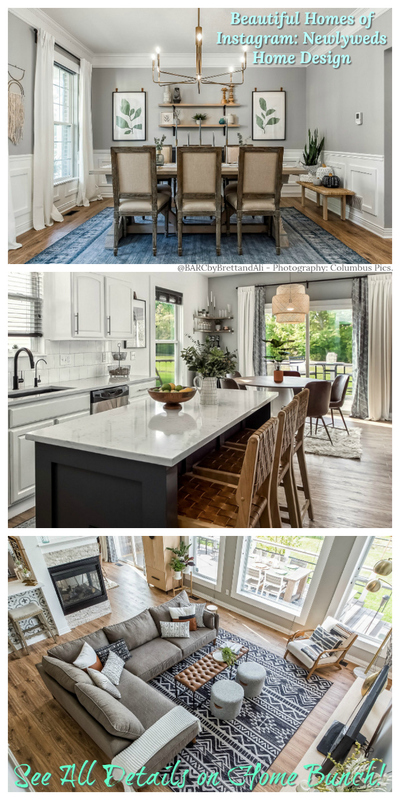 I absolutely love seeing homes that reflect the homeowner’s personality and the more I see Abbie’s home, the more I feel that she’s a person of vision. 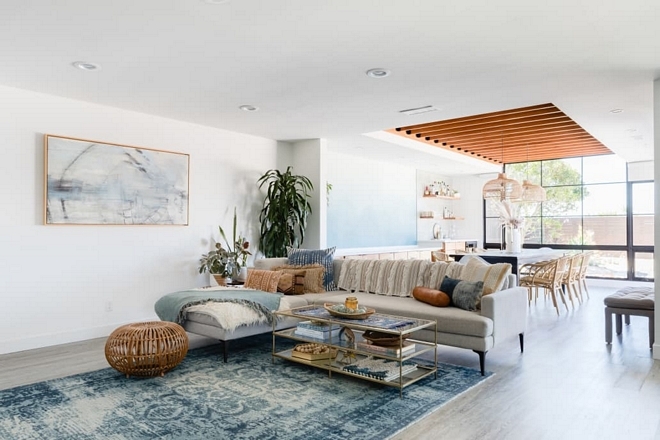 This space has a tall ceiling with wonderful afternoon sunlight. 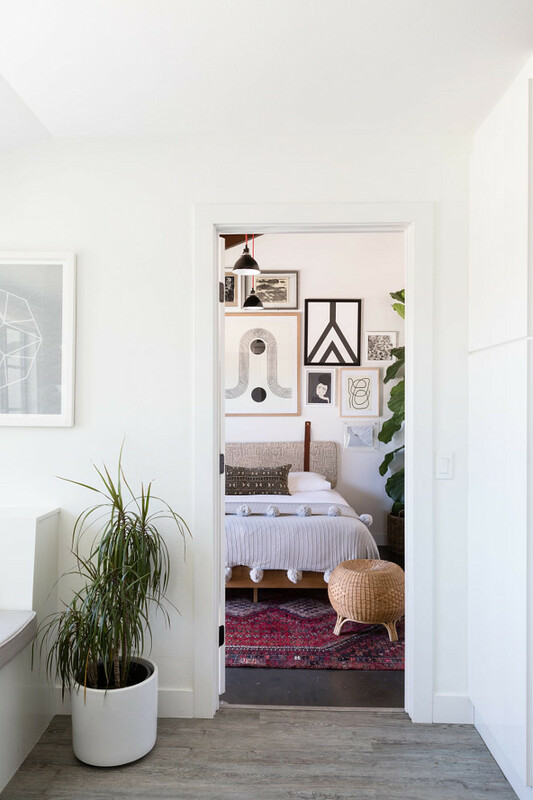 I had the idea to utilize as much vertical space as possible and create a curated black and white gallery wall. I spent time searching for modern/abstract black and white art. The search was so much fun, and I discovered so many new artists along the way. I wanted the wall to flow yet still be eclectic and not too matchy-matchy. I decided to matte some of the art and not others. I also wanted a mix of frames. Art: various: Blockshop Textiles, Mel Remmers, Sofia Shu, Heather Marie Art, Benjamin Ewing, Samba to the Sea, Whitney Winkler, Kim Knoll, Mary Gaspar – similar here. Headboard: Norwegian Wood – Other Beautiful Headboards: here. 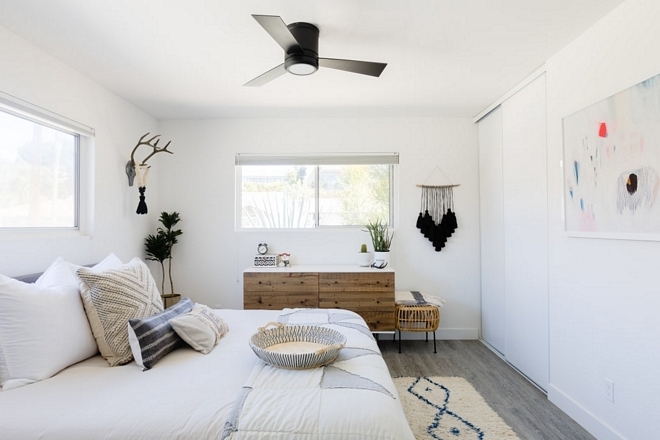 This space is such a mix of high and low. I knew I had to use the Dandelion tile from Marrakesh Design and base the rest of the room around this. Because this was a splurge, we used Ikea with the vanity and sink. I love the modern look of the Godmorgon model. 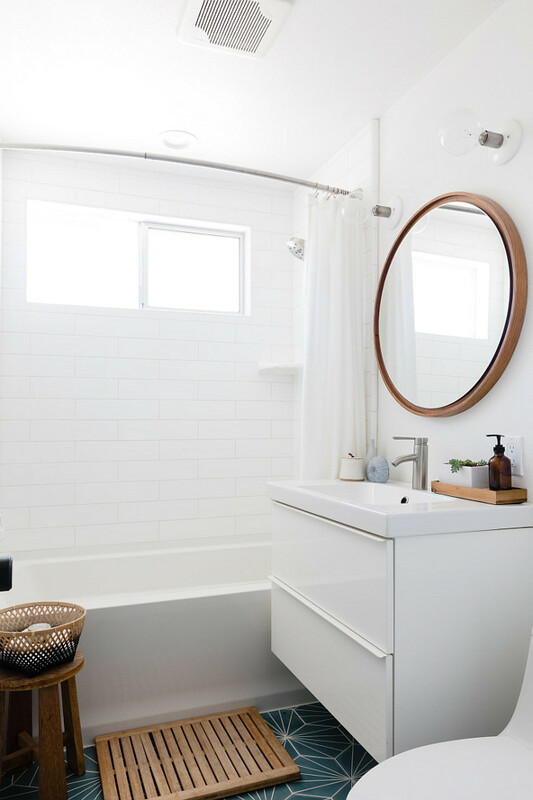 This bathroom is tiny, but it packs a punch. 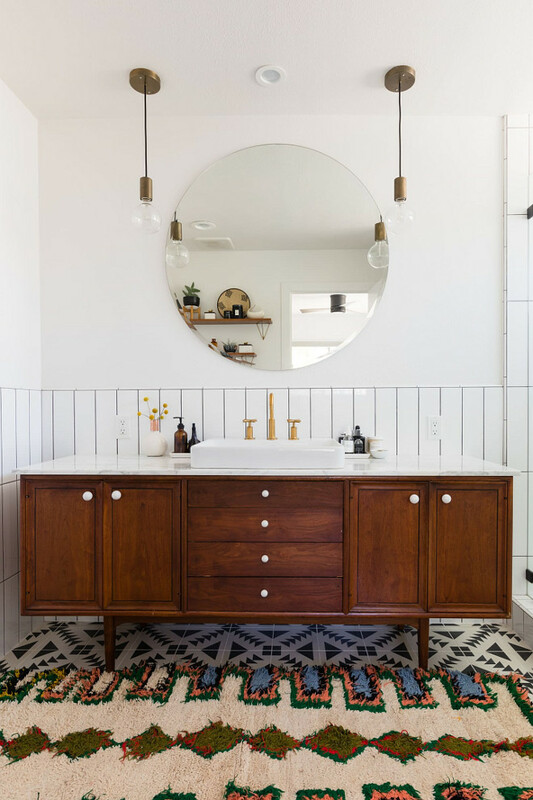 Small spaces like this are great opportunities to splurge on a wallpaper or tile and be able to add a fun pattern without being too much. Tile: Marrakesh Design “Dandelion” – Similar: Starburst Hex Cement Tile. Sink and Vanity: Ikea- Godmorgon model – similar here & here – This one is pricey, but I am loving it 🙂: here. 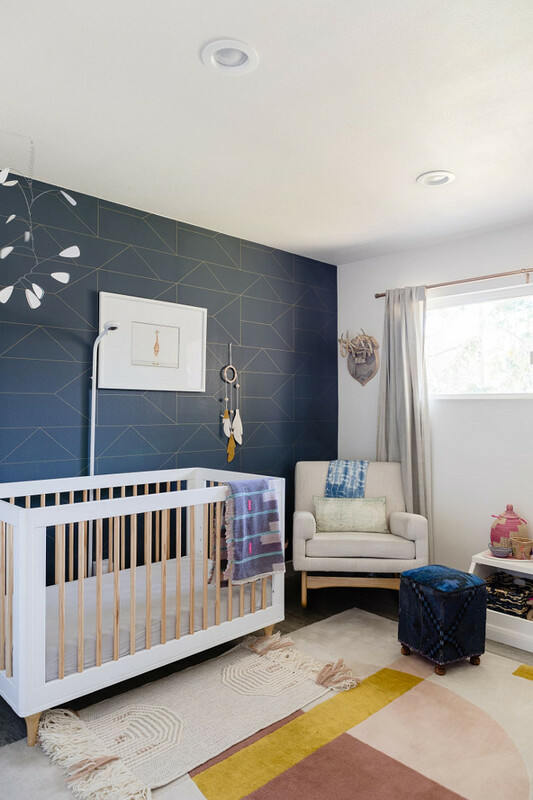 When I was pregnant with my daughter, I knew I wanted to create a space that was not too pink and not too girly. I knew that I would be spending a lot of time at night in there, so I wanted the color palette to be soothing. I also wanted the space to be something that she could grow into! Wallpaper: Ferm Living – similar here. Giraffe artwork: The Animal Print Shop. Toy Bin: Land of Nod. 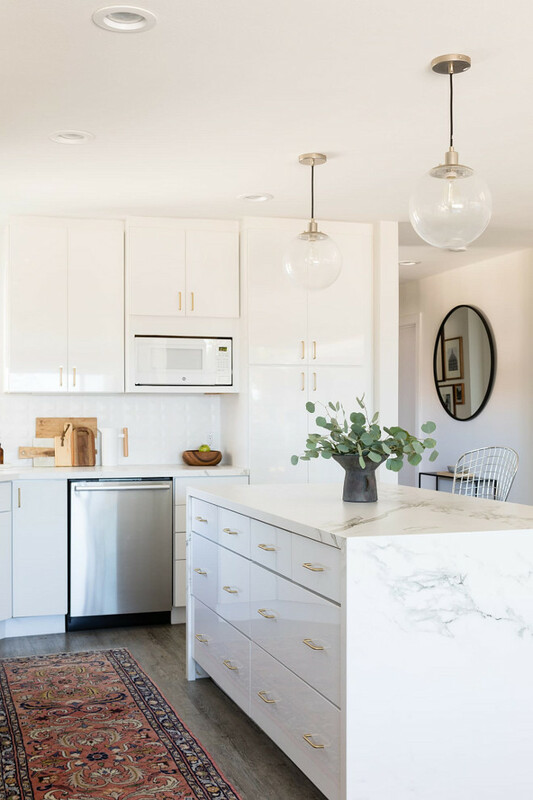 This space is light, bright, and due to the size, we keep things pretty simple in here. 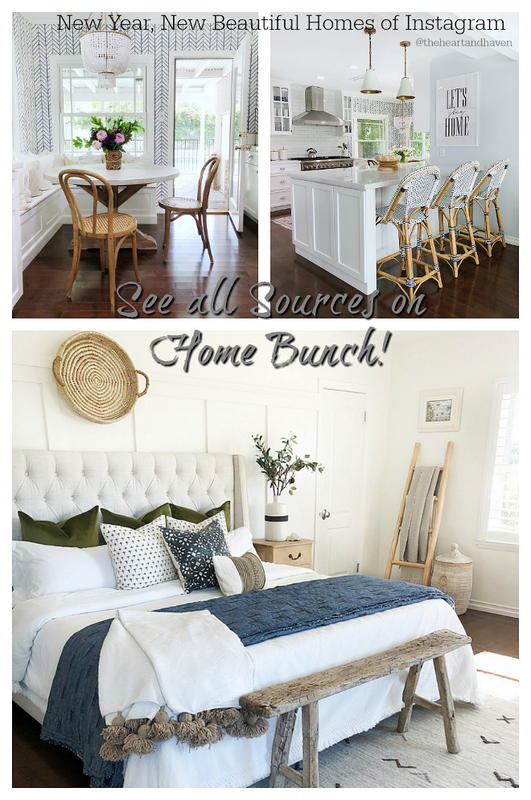 It’s a calming space for me and is ruled by white and blue tones like most of our house! Bedding: Wonderhome NYC and West Elm – (West Elm has one of my favorite bedding! 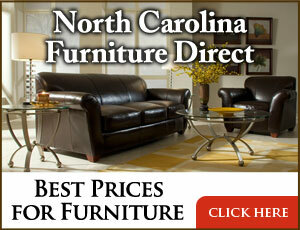 Great quality & value). This could be my favorite space in our home. 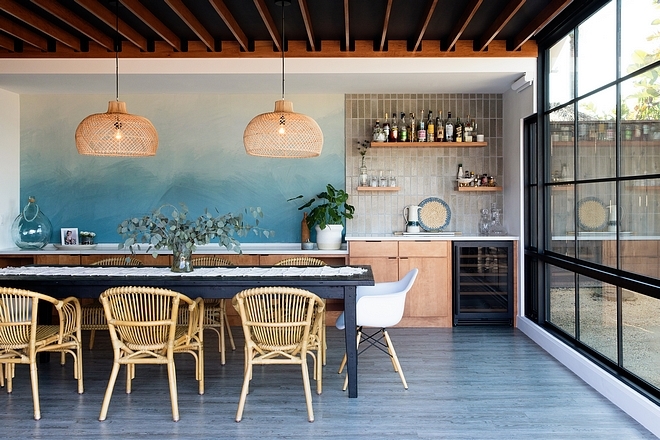 The space started with the idea of incorporating the Tulum tile. We were having a hard time finding a prefab vanity that we liked, so we searched on Etsy for a Mid Century credenza to convert. Staying mostly black and white allowed us to play with pattern and shapes. I think the wood vanity warms up the space. 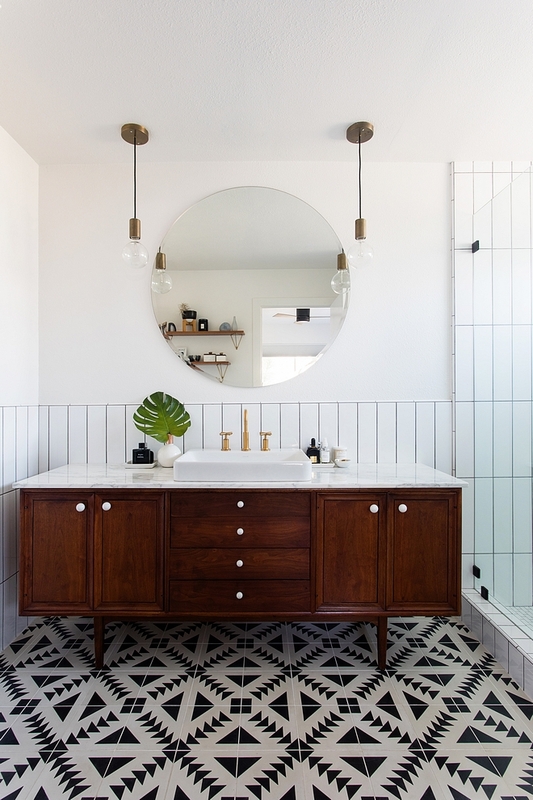 Tile: Tulum – Cement Tile Shop – similar here. Rug: June and Blue – similar here, here, here, here & here. The reality is, grass lawns are expensive and don’t make sense with the state of drought we are in. When we moved in, the grass lawn was a sorry sight. 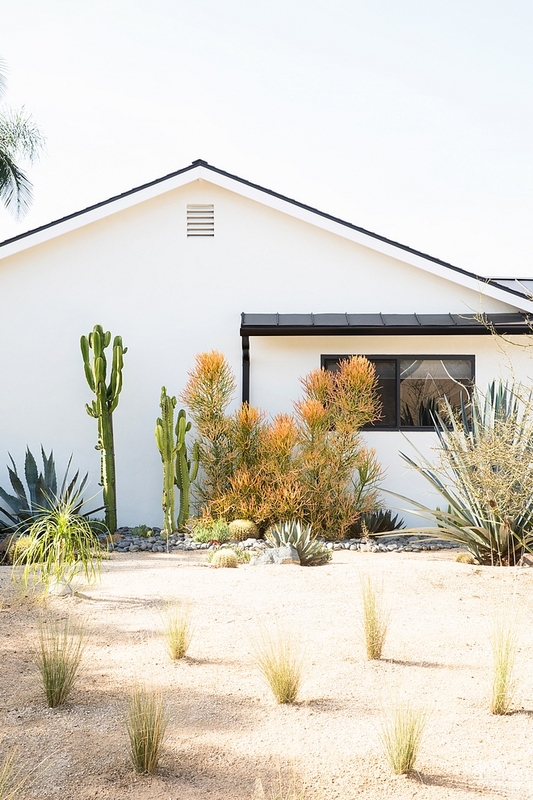 We knew that we needed to convert our exterior to a drought tolerant landscape. 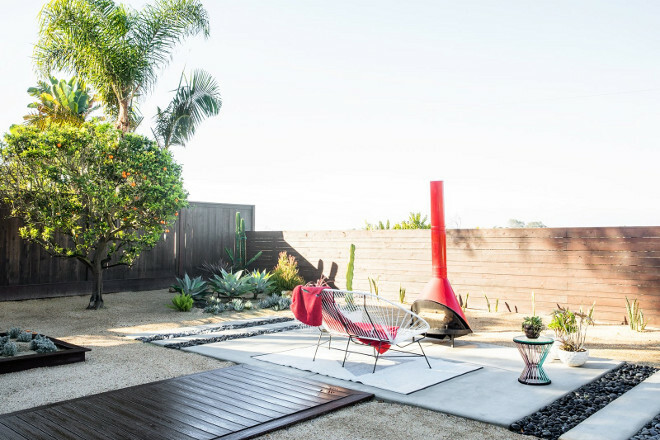 With a lot of Pinterest searching and a love for Palm Springs landscaping, we brainstormed to create a low maintenance outdoor space. I am by no means a landscape designer, but I was able to draw and create some imagery for our landscaper. We now have decomposed granite as our lawn! One of my favorite pieces in our outdoor space would have to be the vintage Malm fireplace that we scored off of Craigslist. I had my eye on them for quite some time. This one popped up in our vicinity. With a bit of TLC, it was as good as new! Outdoor Rug: Lulu and Georgia. 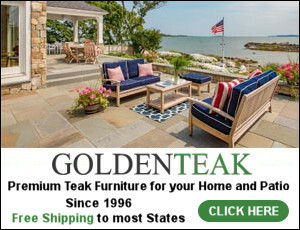 Outdoor Fireplace: Malm Outdoor Fireplace, Craigslist. We love our pocket door system from Western Windows and Doors. The windows can fold back completely into the wall which is perfect for the summer time. 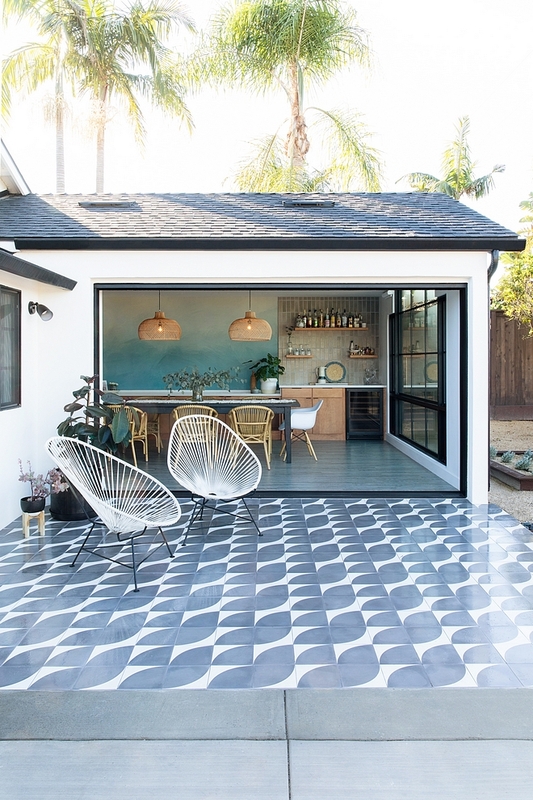 Patio Tile: Cle Tile: “Arc”. 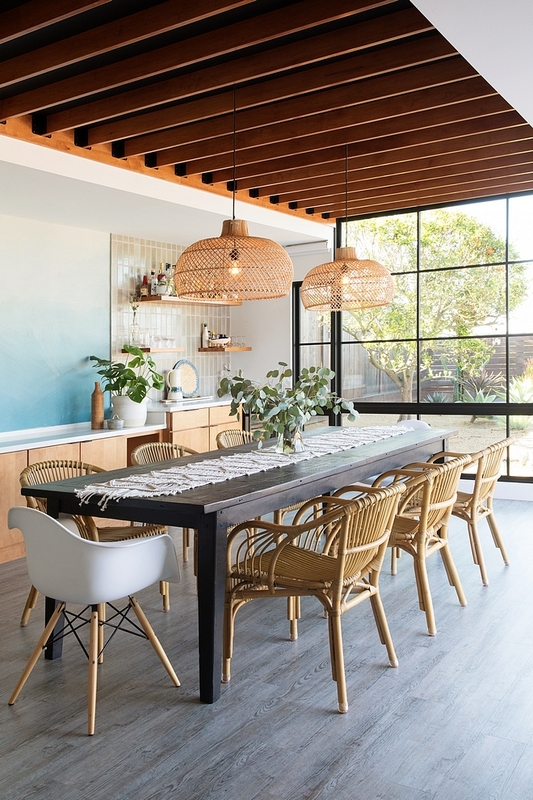 Acapulco Style Chairs: similar here. I profoundly want to thank Abbie for opening the doors of her beautiful home to us. 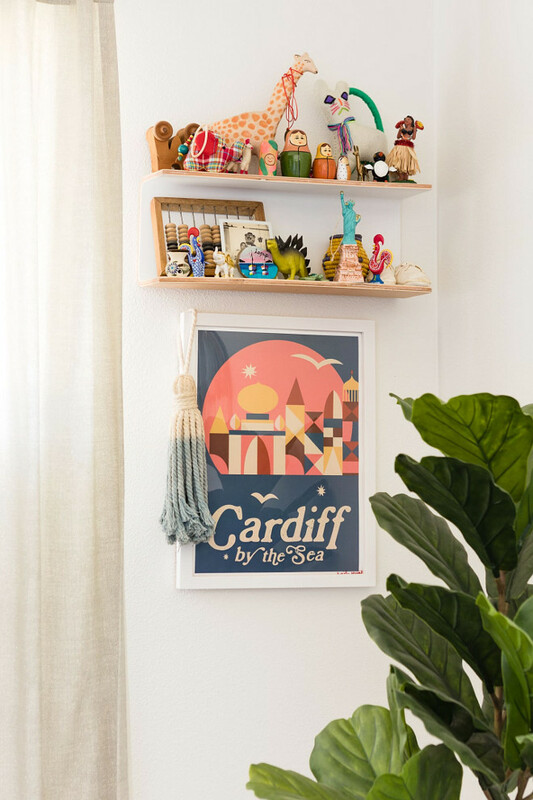 Make sure to follow Abbie on Instagram and visit her website to see more of her beautiful home and work! Photo Credit: Jess Isaac and Jennifer Siegwart.